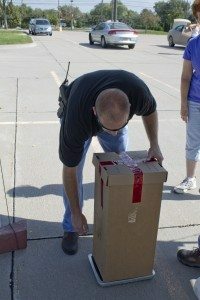 A Buffalo County Sherriff’s offcer secures a box of collected medication. The September Prescription Drug Take-Back brought in 187 lbs of unwanted, unused, and expired medication, bringing the total amount of medication collected this year to almost 600 lbs! We want to thank the Buffalo County Sherriff’s Office, as well as volunteers from CHI Good Samaritan Hospital, Kearney/Elm Creek Elk’s Lodge #984, and Two Rivers Public Health Department, for their dedication to properly disposing of potentially harmful drugs. Check our Facebook page for info on the spring Take-Back.